Perhaps the best of all the great food we ate in Taipei were the dumplings and bao at Din Tai Fung. Before we headed there, we received many recommendations to try the xiao long bao, Shanghainese steamed buns, from this famous fifty-year old chain. Since I love Shanghainese buns, I was excited to try. 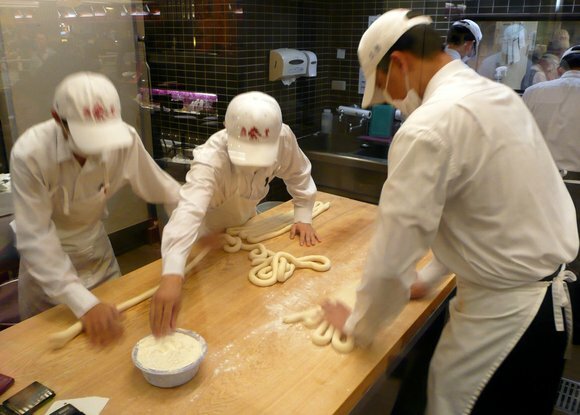 What you might notice first at the branch of Din Tai Fung located in the basement of Sogo department store are the large plate glass windows that let you and everyone else look in on the kitchen. This has to be the ultimate sign of confidence for a restaurant for poor sanitation or hygiene, sloppy techniques and poor quality would become quickly apparent with such visibility. Certainly, this served as a visual promise of what was to come. We took Andy’s parents’ recommendation seriously and ordered basically every type of dumpling they offered. The order taker looked a bit skeptical that the four of us were going to eat so much food. But who could possibly resist? The lovely food we tried. Each dish is named in the video above. 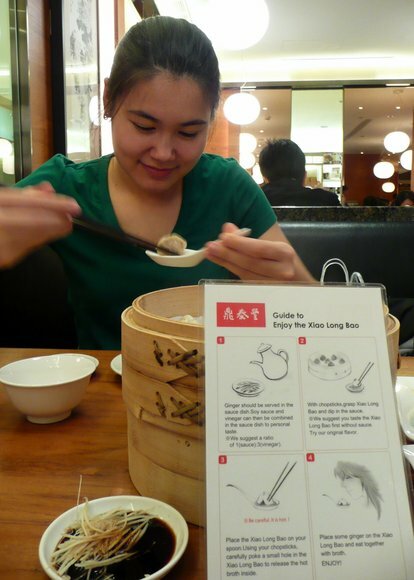 The key item is the lower left-hand dish – this is the famous xiao long bao, the Shanghainese style pork “soup” buns. 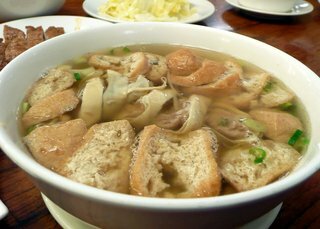 They are called this because when forming them the cook places a small cube of gelatinized soup stock into the wrapper with the seasoned pork. When the buns are steamed the stock liquifies. The goal is to pick up and eat the buns without tearing the skin and, thus, spilling the soup. Sugi didn’t know this the first time she tried to eat them, eliciting cries of anguish from her fellow diners as they watched the soup spill onto her plate. 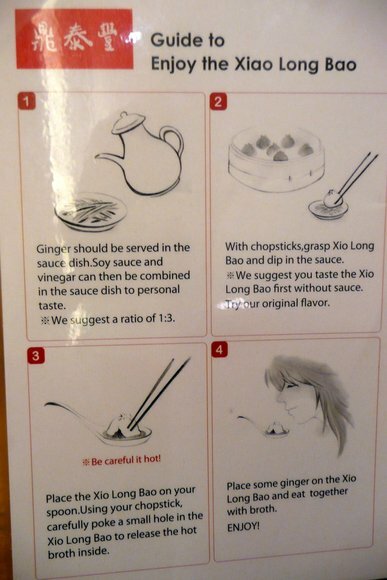 Funnily enough, the restaurant provides a laminated sheet with directions in both Japanese and English (lots of Japanese tourists here) about how to properly enjoy your bao. I’m pleased to announce that next time I fly through Taipei I will be scheduling my flights so I have a layover long enough to allow a trip into town to eat at Din Tai Fung. Oh, but the good news! 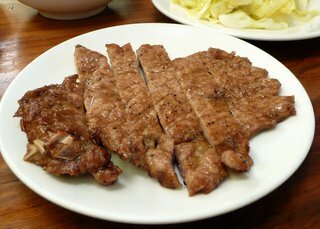 There are some three dozen locations of the restaurant including several in Japan, Singapore, throughout east Asia and a branch in Los Angeles and Sydney. Even if I don’t get to Taipei I should be able to enjoy these dumplings much more often. When does the branch open here in Thailand? This entry was posted in Uncategorized and tagged bao, Din Tai Fung, Dumplings, Eating, food, Jiao, Restaurants, Taipei, Taiwan by christao408. Bookmark the permalink. They look amazing! Damn!It’s making me hungry again… time for a midnight snack. 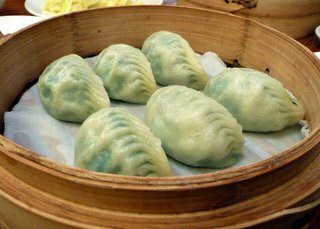 I ate at the same restaurant last month, and it probably one of the best dumpling I have tasted. As my hotel was only a block from Sogo, I went 3 times in four days, lol. 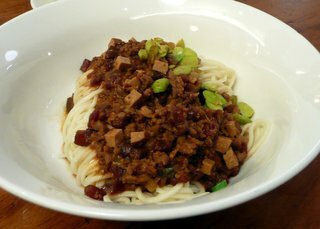 I have tried Din Da Fung in Hong Kong, LA and Singapore, and feel that the one in Taipei is the best. Yummy, yummy, yummy! There’s a location in LA! I have yet to go. I like how the diagram has kind of an anime person. oooooh i LOVE the soup dumplings! they’re soooooo good. We have Din Tai Fung in Singapore. 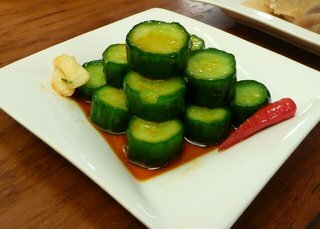 I go there regularly and to my dismay I see that the pickled cucumber is available (never so here in Sg). 😦 No need to travel as far as TPE to enjoy Din Tai Fung; SIN or HKG will do it. I love that you can watch them make all of the dumplings! I really like when you’re able to watch your food being made. It’s quite fascinating and not something that you find too much here in the states. You can get started in opening one in Bangkok!! !The one in L.A. isn’t as good though. Amazing. I love the way they are so conscious about hygiene and cleanliness. The food looks so appetizing. I will probably never get to eat there. How sad for me! !That shrimp omelette in your previous post looked good. Did you think that was bland too? Such yummy food!! I’m lucky because I can get most of those items in YVR! After the Xiao Long Bao I love the spicy wontons. Did they have green onion pancake?? That is very good, too, and even better wrapped with scallions and beef. 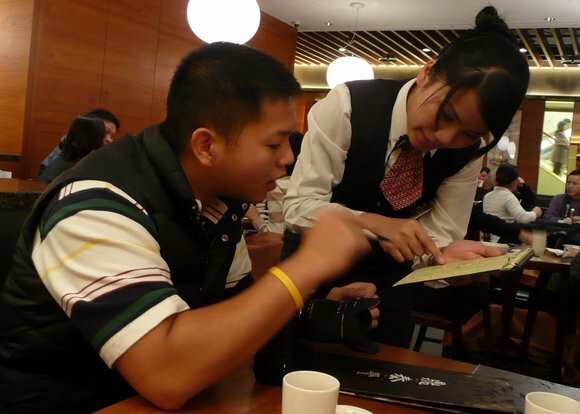 @ElusiveWords – Oh, Andy ate plenty… Is your Din Tai Fung a real one? I don’t see Toronto listed on their four-page business card showing global locations. Maybe a counterfeit! @lil_squirrel4ever – They may have had green onion pancakes but Andy handled the ordering so never saw them. Omg after seeing this I’m going to get Chinese. wow that looks so good! i seriously need to go get some dim sum soon. What a feast to the eyes! Should try the one in Hong Kong as well. Then, you can do a comparison! The dumplings are what you come here for. Problem is that the non Taiwanese branches don’t taste the same. @CurryPuffy – Let’s put it on the list. @LostSock21 – That’s what everyone is saying. 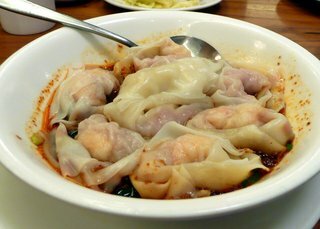 @dearmisery – A Korean friend of mine just moved to Shanghai so perhaps that will give me the incentive to go try Shanghainese food in its birthplace. @Rm2046 – Everyone is saying that the branches outside of Taiwan aren’t as good. Wonder why. I heard that the Din Tai Fung in Taiwan is still the best! 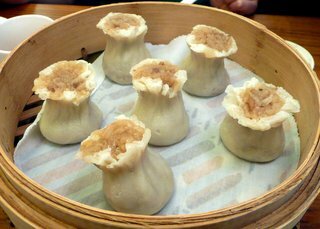 How in the world did I miss this post?Xiao Long Bao is, hands-down, my favorite dim sum. 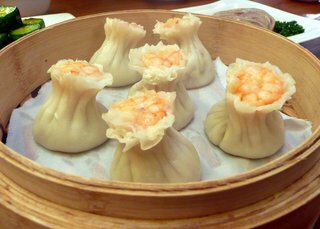 And Din Tai Fung here is, hands-down, the best.Try as I might, I cannot replicate these. I have some of the basic concepts, but I just cannot figure out their formula. Also, I was talking to Osmundaregalis, we both think you should do a professional travel food show. Very nicely done. @arenadi – Frankly, I was a wee bit surprised that you hadn’t commented on this entry. As for the professional travel show, let me know when you have the professional budget to sponsor it! Ha ha ha… @moijesuisfou – That’s what everyone is saying. @ElusiveWords – Yeah I don’t see a Toronto location. Or is Matt really in Toronto? !I took lots of photos and ate lots too haha! Kenny and I were actually at the one in Sydney just a few months back… the Taiwan one is still the best and the most reasonably priced. @ungrandvoyage – I’m amazed at how consistently people are making that comment. Proof that I don’t need to visit the other branches, then. Will just make it a point to schedule a layover going through Taipei on future trips to the US. sugi is 2 cuteee! I HEART THIS POST! perhaps nxt time u r in LA, we can take a trip to arcadia and get sum dim tai fong XLB!!! @Sinful_Sundae – Yeah, I think Andy and Sugi are just a great couple and Tawn and I really enjoy hanging out with them. 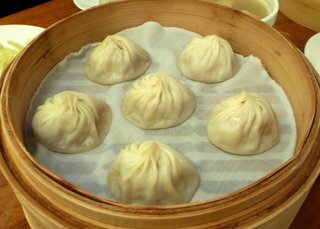 How are the XLB in the Arcadia Din Tai fung? Several Chinese friends in LA have complained that they don’t taste as good there – maybe the water gives the dough a different flavor or the pork isn’t as tasty?